Welcome to Episode 6 in our series where I, the GREAT Aunt, team up with Landon, the GREAT nephew, to bring you, our GREAT readers, a-picture-with-a-poem sort of thing. In each episode, I write a poem and Landon illustrates my poem. If you missed previous episodes, you can view them by clicking below. Today’s poem is a chain reaction of thoughts: November-Thanksgiving-Food-Especially dessert-Pie! Since I’m not a pumpkin pie fan…(I know! But I just don’t like it 🙂 )… I went with one of my favorite kinds of pie. And…Yum! Landon’s drawing will make your mouth water! Thanks so much for joining us for Episode 6. We’ll see you back in two weeks just in time for Thanksgiving leftovers 🙂 And that’s a promise! Please head on over to Keri Recommends for all the Poetry Friday fun. Peach Pie Yummy! The poem and drawing made me imagine I could smell one cooking. I can’t wait to see what the two of you come up with for Thanksgiving. I know what you mean, Michelle.I REALLY want a piece of pie! Thanks for dropping in! Enzo is saying “Peach Pie Bye Bye” after we read this. He’s studying pies this week at preschool. Great work by two greats. Very cute! And how fun that he’s studying pies this week! This is my first Great Aunt and Great Nephew post…what a fine, fine thing! I’ll be going back to check out all the others with a salute to Family Collaboration! So glad you popped in for pie, Heidi! Hope you enjoy the other episodes and tune in for the new ones. You and Jama…both riffing on pie and making us drool! I know! It was definitely a Poetry Friday Pie Feast! Thanks for coming by, Mary Lee. I love these, Penny, have always been just wonderful. My husband’s favorite was peach pie, so you’ve touched me tonight quite a bit. When speaking of pie, most often it is “bye-bye”. And Landon’s art is so lovingly detailed-terrific! Thanks, Linda. I imagine that each bite of peach pie brings a nice memory. Thanks for visiting us! Peach pie is so delish! I love all fruit pies and meringue pies. Actually, pumpkin may be the only kind of pie that I don’t LOVE! Thanks for coming by. I love this fun little series, Penny. Your poems are spectacular and Landon’s art blows me away. I just went back to all the prior posts to see where he displayed the pencil in each picture. The Moose art almost looks like a pencil could be worked into the mountains. 🙂 Thanks for sparking my interest each week. Creativity abounds! Ah! You noticed his pencil. And, yes, he started including it after the moose. We sure enjoy you coming by, Carrie. Thanks! Thanks, Bridget! I’m sure your peach pie will be delicious. Yum delicious poem and art! Thanks, Catherine. Glad you enjoyed the episode. I like both kinds of pie, and pie poems, and pie pictures, and…hehehe! Yummy post! Glad we could cater to ALL of your likes, Julie! Yummy comment! 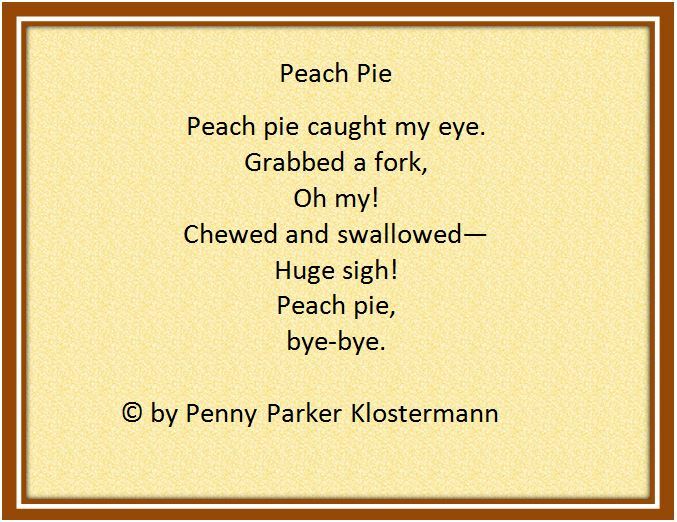 I’m with you: don’t like pumpkin pie but love peach pie (and your peach pie poem). The art is absolutely peachy…LOL! Ah, another who prefers peach over pumpkin! Yay! Thanks for coming by,Teresa. Great stuff. I am really enjoying this series. Thanks for sharing. Love the art and the poem. Thanks, Rosi. Glad you’re enjoying it. So are we! You are a great aunt. Landon’s illustration of the peach pie makes my mouth water. One of my favorites. Peach is one of my favorites, too, Penny. Love the tendrils of heat creeping off Landon’s picture. Oh, my! 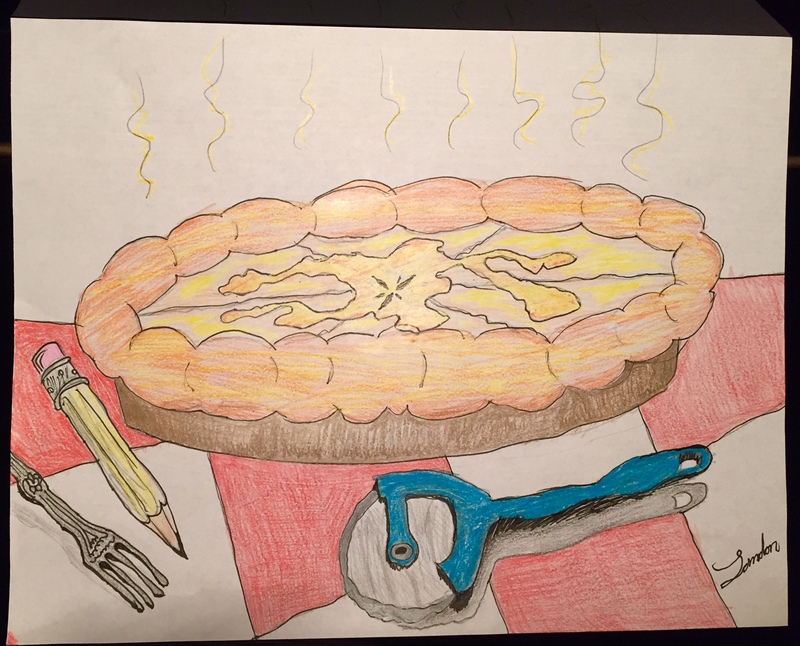 Your short clever poem and Landon’s art have captured the pie’s essence in a nutshell – er – pieshell. Thanks, Carole. I love the tendrils of heat, too. It looks fresh from the oven! Like Jack Sprat and his wife – we’re a perfect pie pair. I’ll happily hand you the peach slice if I can take the piece of pumpkin! Well done Aunt Penny and Landon! I think we have a deal, Cathy! We do make a perfect pie pair. Thanks for coming by. Oh my, PIE! This is my favorite episode so far!! LOVE the poem and pie art. Mmmmmm! I had a feeling you’d find this post quite tasty, Jama. I need to head over to your place and check out your pie post. I saw reference to it in Keri’s links. Thanks for joining us today. Hurray, the dynamic duo are back! Love the poem Penny, and Landon’s illustration is totally scrumptious. The pie crimper is a super cool detail in the picture. Isn’t the crimper awesome! Landon’s mom is a cook deluxe, so he gets plenty of exposure to cool cooking tricks and tools.